A professional and aesthetically pleasing site, is crucial to give a good first impression of your business – but equally important are ease of use, consistency, and navigation. Good design is fundamental to the success of your site. WebConsulting will work with you to ensure that your site design reflects the overall marketing strategy of your business, and is targeted at the specific audience you are trying to reach. Our Design approach provides you the flexibility to incorporate your existing colour scheme or logo, or we can assist you with logo design as well. We can also implement design concepts prepared by your own graphic designer. The site development process generally commences with the development of master site templates to reflect the agreed design. Once the design templates are approved, they are used as the basis for development of the rest of the site – although there will usually be some minor variations in page structure to cater for individual page content. Clients are closely involved throughout the development process and will have opportunities to review and approve page development as the site evolves. As a part of the development process WebConsulting incorporates Search Engine Optimisation (SEO) techniques to ensure that your site can be read by Search Engine Spiders and to improve your exposure on Search Engines. It is important once your site has been launched, that the information it contains continues to be current and accurate. Out of date or incorrect information on your site can give a poor impression on the professionalism of your business. Sites that are regularly updated are more likely to inspire return visits from your customer, and are also given greater credibility (and therefore higher ranking) by Search Engines. 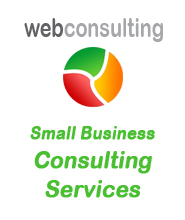 WebConsulting offers a number of different site maintenance options. As the general public has become more aware of the benefits provided by shopping over the Internet (and more trusting of online payment systems), eCommerce based websites are becoming increasingly popular. WebConsulting can work with you to develop an eCommerce solution to meet your specific needs – from simple form based payment interfaces, through online credit card payment facilities, right up to full blown online stores and shopping carts.